Last year, I posted a big calendar on a bulletin board in the kitchen to keep track of everyone in the family’s appointments and commitments. I suppose that worked for some things but it was incomplete. It didn’t tell any of us anything about what Mom and Dad were up to at work because those schedules are complicated and we kept them on our computer in Outlook or Lotus Organizer. This year, we have moved everything to Google Calendar and it is much better. Everyone has their own calendar but we can all see them from our computers whenever we want. 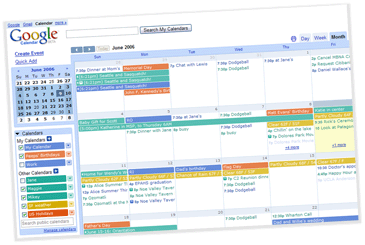 A tick of the box lets me see my calendar with both kids and my husband’s calendars overlayed on top so I can quickly see conflicts. I even made a calendar for shool holidays. But I can also just see my own calendar without the other noise. Even the kids can check and see if I’m too busy to take them to a friend’s house without following me around pestering me. But what about when the Internet goes down, as happened last week when my cable company was having some problems? Do we miss all our appointments? I downloaded Essential PIM (which is freeware) and using the iCal feature, it imports my Google Calendar in a couple of clicks. Â Now we use that bulletin board for photographs. And since my new solution is completely free, I even pocket an extra $12 every year.